For a lot of us winter is the time for chunky knits, hot chocolate an cosy nights in watching Pixar movies (or maybe that’s just me), but mostly..it’s a time where we can all indulge in a bit of thick, stodgy food to warm our bellies and hearts! 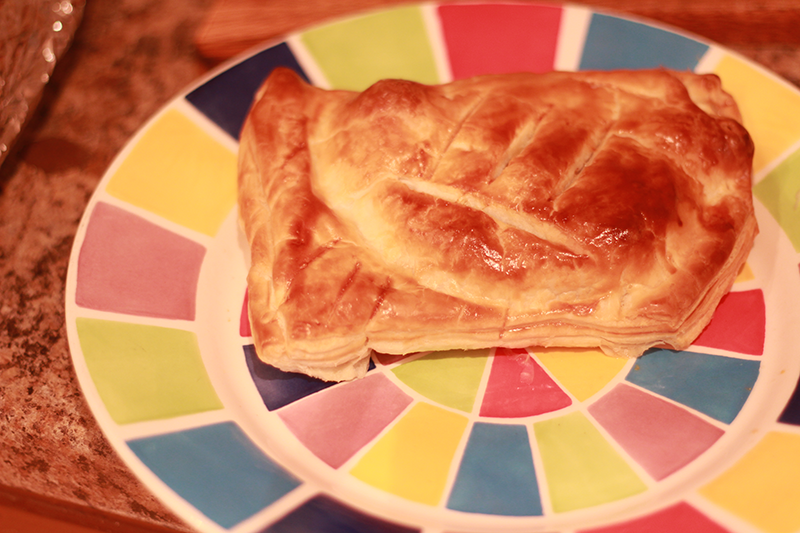 Now I love a good bit of pasty and I’ve always wanted to make a lovely dinner pastry from scratch; so here I’ll go through this quick recipe that that tastes delicious and is sorta/kinda healthy. Enjoy and let me know if you plan on making this too! Sift together the flour and the salt and rub in the lard. Stir in enough of the water to make a soft dough, wrap in clingfilm and chill for 20 minutes. Put the butter between 2 pieces of greaseproof paper and flatten out with a rolling pin until it is a rectangle 10 x 7.5cm/4 x 3in or something close to that. Roll out the dough to another rectangle that measures arouuuund 12.5 x 25cm/5 x 10in. Take the butter out of the paper and put on the dough rectangle. Bring the corners of the dough together to make an envelope. Chill for 10 minutes. Roll out the envelope on a floured surface to make a rectangle that is 3 times longer than it is wide. Fold one third into the middle and then the other third on top. Seal the edges lightly with a rolling pin and turn the pastry 90 degrees. Repeat stage 5 and chill for 30 minutes. Repeat this rolling and folding twice more and then chill for another 30 minutes and then do two more – the pastry will have been rolled and folded six times altogether. Now roll out on a floured surface ready to use! 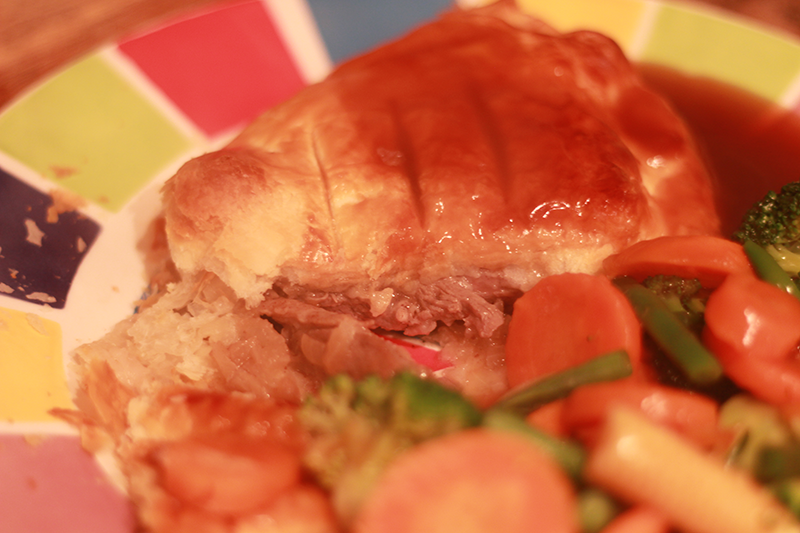 OR…if you can’t be arsed with all that, you can by “Jus Rol” pre-prepared puff pastry from any supermarket and use that instead. 1. Pre-heat the oven to 220 degrees (around gas mark 4/5). 2. 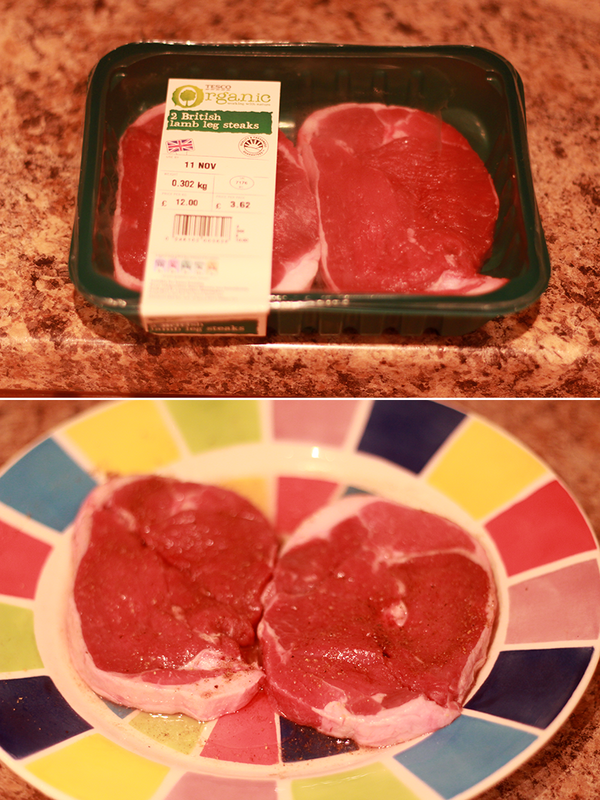 Cut the lamb into 4 equal pieces, heat the oil in a frying pan and quickly seal the meat on all sides, remove from pan and allow to cool. Then add the onions to the pan and cook over a gentle heat until just soft, approx. 5 minutes. Remove from pan and drain and allow to cool on kitchen paper. 3. Cut the pastry into 4 equal rectangles. 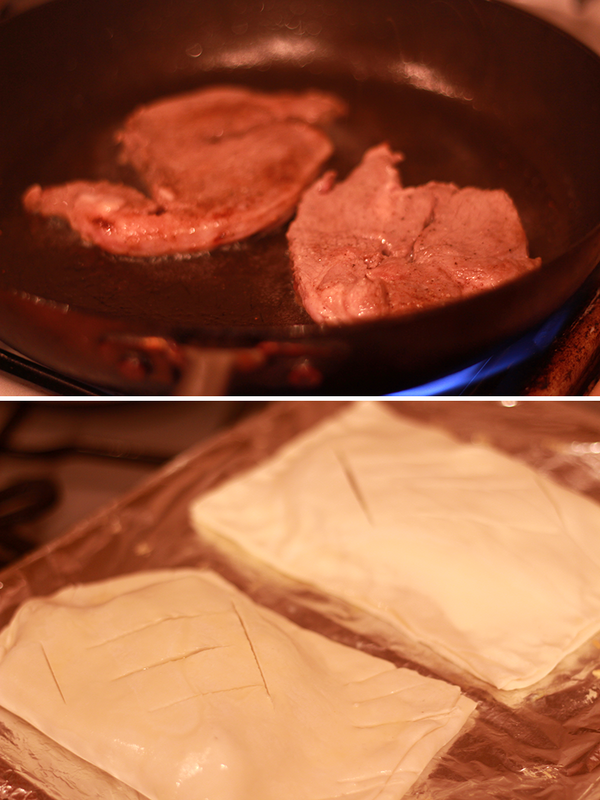 Divide the cooked onions between the pastry pieces, placing them on one half, then top with a lamb piece on each. 4. Brush the edges lightly with a beaten egg and bring the uncovered half up and fold it over the filling, pressing the edges firmly together to seal. Trim edges with a sharp knife and flute if desired. Make several cuts in the top to allow the steam to escape and also for decoration. Brush with beaten egg, place on a lined baking tray and bake for 20 minutes. Serve hot with veggies or even butternut squash!